This blog is about my journey with sisterlocks and learning to love and accept my natural God given inner and outer beauty. PLEASE DO NOT COPY ANY PHOTOS FROM THIS BLOG WITHOUT MY PRIOR PERMISSION. Well, my first retightening went well; my hair grew more than I expected. My consultant said we can stay with retightening at 5 wk intervals since I had no slippage. 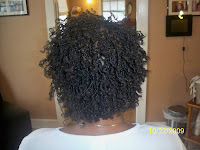 Overall it took her approx 2 1/2 hrs to retighten all 487+ of my sisterlocks. She also washed my hair again for me. I really appreciated that because I wasn't looking forward to doing it. I was too afraid that I'd screw it up and have slippage all over that place. I did a braid out about 1 1/2 wks prior to getting the retightening and didn't take a picture. It was really cute, I'll do it again and post a pic of it next time. Overall, I'm really happy with my hair. I've had some family members that weren't too happy about my decision. But my husband is very supportive and understands my reasons. So that is all that matters. I've gotten some that asked why because they are used to seeing me with the usual long wrapped style. They don't fully understand what I went through to get that look and it was time consuming and costly. 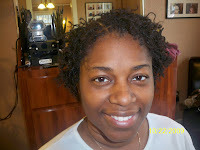 I think my sisterlocks look GREAT!! My new motto..... "Spritz, fluff and GO"! 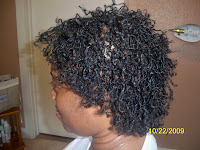 Congratulations on your Sisterlocks journey.